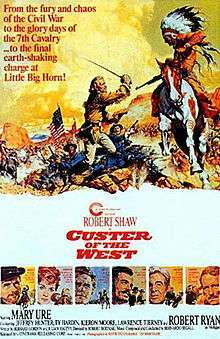 Custer of the West is a 1967 American Western film directed by Robert Siodmak. It tells a highly fictionalised version of the life and death of George Armstrong Custer. It starred Robert Shaw as Custer, Robert Ryan, Ty Hardin, Jeffrey Hunter and Mary Ure. The film was shot entirely in Spain. The plot of the film was very close to that of the 1941 film They Died with Their Boots On, in which Errol Flynn played Custer. With no better offers to be had, famous American Civil War upstart officer George Armstrong Custer takes over the Western Cavalry maintaining the peace in the Dakotas. He soon learns that the U.S. treaties are a sham, that Indian lands are being stolen and every excuse for driving them off their hunting grounds is being encouraged. With his wife Elizabeth (Mary Ure) Custer goes in and out of favor in Washington, while failing to keep wildcatting miners like his own deserting Sergeant Mulligan (Robert Ryan) from running off to prospect for gold in Indian country. After trying to humble the prideful Indian warrior Dull Knife (Kieron Moore), Custer leads the 7th Cavalry into defeat. The film met with a largely negative reaction from critics. At Rotten Tomatoes, the film received only a 25% "rotten" rating. It holds average rating of 4.1/10. Many were unimpressed by the attempt to shoehorn two different viewpoints into the same film – the mistreatment of the native Americans by American troops, and the portrayal of Custer as an American hero who was not to blame for the disaster. The general inaccuracies of the film were also questioned, particularly the portrayal of the Battle of the Little Bighorn. Custer of the West was released to VHS by Anchor Bay Entertainment on July 14, 1998 and on DVD by MGM Home Video on May 25, 2004, as a Region 1 widescreen DVD. ↑ Niemi, Robert (2006). History in the Media: Film And Television. ABC-CLIO. p. 28. ISBN 1-57607-952-X.